Growing up, part of my family's Thanksgiving ritual was to go around the table and share something that we were thankful for. I hated it then--I thought it was embarrassing--but I love the idea now. Two years ago, when Andy and I hosted our first Thanksgiving, I bought blank seating cards for our guests to write a note of thanks. We mixed them up and placed at random one card at each setting to be read aloud during dinner as everyone guessed who wrote what. With our own family just starting out, we've been putting some thought into how we will handle holidays at the Sears house. We hope to emphasize experiences over gifts. * Let's look forward to baking Santa's cookies, snuggling in our Christmas jammies, waking in the middle of the night to check for Santa, or rising at 4 am to open stockings. Let's anticipate Poppa's unveiling of his Christmas Light Spectacular, and baking the first pumpkin cake of the season. So, I've been considering how we might celebrate Thanksgiving all month long, and an advent calendar seemed like just the thing. 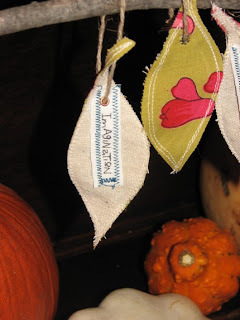 One Etsy seller had the clever idea of making fabric leaves with "blessings" sewn onto the back. After following a tutorial to construct a tree made from twigs, beginning November 1 a leaf is hung each day and provides an opportunity for reflection and family discussion. These pouches are fun and would be perfect for school aged children, to fill with treats (edible or otherwise). Another idea I found is a twist on the 12 days of Christmas. 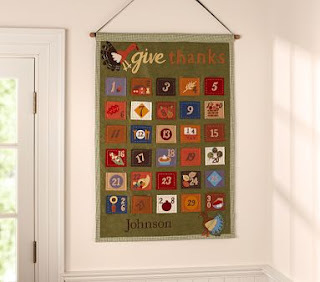 Instead, the 12 days of Thanksgiving are celebrated by baking twelve special dishes throughout the month. I like this one in particular, and to make it even more about the season, the goods could be given away or shared with family, friends, and neighbors. Late last night I reached over to Andy and whispered that I wanted to do an advent activity this year. 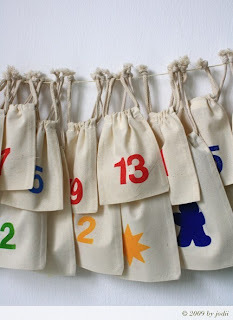 We talked about it for a few minutes and quickly deduced that in order to execute any advent (unless it is a simple one where a piece of candy is consumed each night before bed) we will be required to commit some amount of time to it every day--time that we don't really have. I know this is counter to the spirit of the whole idea, so we made a compromise. We're computer savvy, 20-something new parents with plenty to be thankful for so we decided that each day we will share with each other via email one thing for which we are thankful. To start it off, November 1st's note of thanks is for challenging myself to work through the grief of 07/08, and for Kauai and the Kalaulau Trail. Without our commitment to each other, a shared belief in our potential together, and a willingness to do what it took to push ourselves to the other side, Andy and I both might never have grown in the ways we needed to. And then we would not have been given the opportunity to know Roscoe, who we are thankful for every single day. *I will share that Roscoe's Christmas gifts have already been purchased (we just couldn't wait!) and stowed in our closet, in the good old fashioned way.